I got my new car Monday! 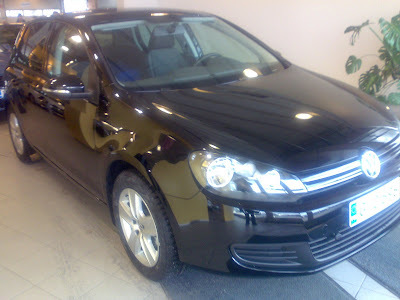 I bought a Volkswagen Golf which actually looks almost the same as my previous one. Despite the worldwide recession Volkswagen got a 15% profit rise last year and I had to wait for 3 months for the car. I can't even buy a Volkswagen and take it home from the store with me. I place the order and the car is assembled according to my wishes. Here is the car just before I drive it out of the store. The picture is unfortunately a little blurred. I took it with my cellular and I have not learned to keep it steady yet. Finland has a long tradition of vehicle inspection, dating back to year 1917. "Määräaikaiskatsastus" (periodic inspection) is required for all passenger cars, vans, trucks, ATVs and for trailers with maximum structural weight of more than 750 kilograms. Inspection interval depends on vehicle class and usage. For privately-used passenger car, inspection must be carried after three and five years counting from the specified date of first deployment and every year after fifth year. My old car was bought by my son and he has to take it to the first inspection. According to the Inspection statistics Golfs registered 2005 are doing very well. Only 1.7% have been rejected. The statistics don't look good for Renault Laguna, of which 31% were rejected! I think my son got a very good and and after it was washed inside and out, it looked like new. The new car is so cool! I seem to have to be careful because the car seems to go on its own (it has more power than the old one). Is that a hidden self-portrait there, nearby the right front light? Dear Leena, my warmest congratulations!!! I love Golfs!